Disney is always thinking about and investing in the future. Movies, theme parks, and cruise ships make this Fool a happy long-term investor. 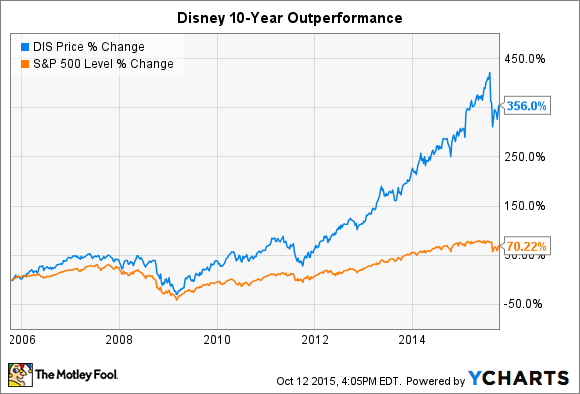 Few consumer goods companies plan for the future quite like Disney (NYSE:DIS). The House of Mouse was founded over 90 years ago and has constantly reinvented itself along the way. At its core it was an animation studio, but through the years and iterations it has become so much more. This is the company's enduring strength, an ability to continue to sell "wonder" to millions of consumers but to do it through so many different mediums. Disney continues to plan for the future and I plan on it being a "forever" stock in my portfolio. Movies, a new theme park, and an expanding cruise line are just three ways Disney continues to grow. CEO Bob Iger's enduring legacy at Disney will largely be centered around a handful of masterful acquisitions. The company acquired Pixar in 2006, Marvel in 2009, and Lucasfilm in 2012. These acquisitions have already paid massive dividends for the company and most expect the next Star Wars film to shatter all box office records. When you combine these studios with Walt Disney Animation and a few co-producers, Disney is slated to be releasing over 25 new films by 2020. These are not low-budget art house productions.The sequel to the smash hit Finding Nemo, a number of Star Wars movies, Toy Story 4, and a number of new franchises that are sure to become beloved hits and spin off many sequels in the future are on the slate. Filmmaking can be a tough business because one hit doesn't automatically beget another. Disney has built a recurring revenue model in a business that has traditionally been boom or bust. It's planning and grand scope are what make this such a wonderful company to own. Shanghai Disney, which is scheduled to open in 2016, will be the largest and most expensive theme park in China, with some estimates putting the price tag at more than $5 billion. This is exactly the type of investment that a forward-looking company like Disney should make. It's Parks and Resorts segment is the second-largest for the company in terms of both revenue and segment operating income and continues to be a strong growth portion of the business. An investment in theme parks requires hefty upfront costs but gives a multidecade return. For a company that has financing, a treasure trove of IP to build desirable rides, and the managerial know-how to operate the park efficiently, this is a solid long-term investment. Disney obviously has all three and I expect Shanghai Disney to become the most visited and most profitable of all of the company's theme parks. Furthermore, Disney has shown a remarkable ability to tailor its products for international audiences while retaining the core elements of its brand. One example at the new park is replacing the iconic Main Street, U.S.A. entrance with Mickey Avenue. While this is being done for obvious reasons -- World Bazaar is the entrance at Tokyo Disneyland -- it shows a willingness to adapt to foreign markets, which is a great sign for future growth. Disney recently announced that all four of its cruise ships will sail out of Florida in early 2017. The company will be offering both three- and four-night trips as well as longer seven-night excursions to the Caribbean. Disney presently operates voyages around the globe from Europe to Panama to Alaska but has chosen to center all travel in early 2017 out of Florida. The company is thinking years ahead to lock up mind share and disposable income from its loyal customers. Disney has global reach and the flexibility to put its assets -- in this instance its four ships -- wherever they can generate the greatest returns. While the cruise line is a relatively small portion of the overall Disney pie, it goes to show just how expansive and monolithic this company has become. Disney has come a long way from being a small animation studio. This article didn't touch on ESPN, which is its largest profit center, and still presents compelling reasons to buy and hold the stock for years to come. Sometimes one company can provide a good deal of diversification on its own. Disney is one of those businesses and if you haven't considering picking up some shares, I recommend you take a deeper look at this beloved and cash-gushing company.